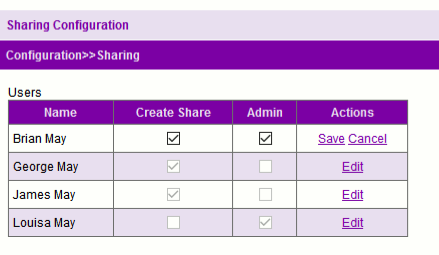 The Configuration page ensures you can monitor who has access to Data Sharing and set up your inclusions and exclusions. Administrators can set up who has access to use Data Sharing. Users can have access as a standard user or admin. 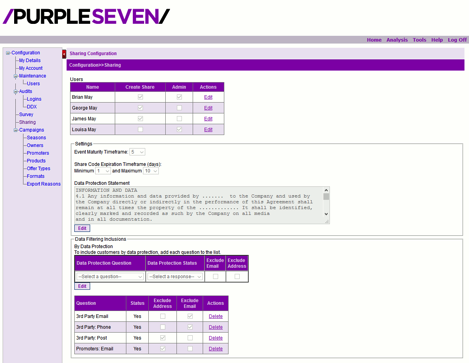 If you want to set up a new user from scratch you will need to get in touch with us at support@purpleseven.com with the users email address and full name. Data Protection Statement: The data protection statement as agreed to by all touring companies. Administrators can specify by data protection questions which customers are included within the data shares. Administrators can specify specific customers are excluded within the data shares. 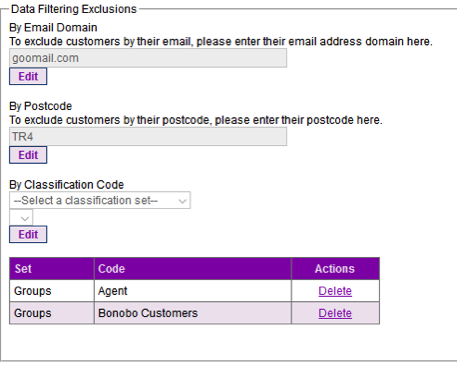 Exclude customers by email domain, such as the venue. Click on Save at the bottom of the page and your account is updated with your new settings.